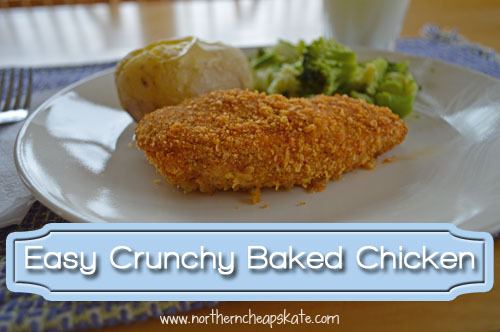 My favorite meals are the ones that are tasty AND easy, and this super easy crunchy baked chicken recipe fits the bill. The recipe is one that my mom shared with me years ago when I was a newlywed. I’m not sure where she got it, but it’s a family favorite of ours to this day. Finely crush the cornflakes in a zip-top bag and add the paprika, salt and pepper. Shake the bag to mix the ingredients well. Toss each chicken breast piece in the cornflake mixture and place them on the greased baking sheet. Lightly spray the top of the chicken with the cooking spray. Bake at 400ºF for 30 minutes or until outside coating is crispy and juices from the chicken run clear. One of the things I love about this recipe is that it is easy to adapt to what works best for your family. If you have little ones who don’t like as much spice, you can drop the paprika and pepper to 1/4 tsp. And if you have a larger family who eats more chicken, you can easily double or triple the recipe. If you’re lucky enough to have any leftover chicken, it’s great in salads or wraps! Looking for more meal inspiration? Be sure to check out our other frugal recipes! Any suggestions for an alternate to spraying the chicken breasts with cooking spray? Is this what makes them crisp up? Sounds like a great recipe. Thank you. Yes, the spray is what makes them crisp up. If you have a mister for olive oil or vegetable oil you could try misting it with the oil instead.